The third of four new Assyrian Heavy Chariots rumbles forth to battle! Like the others before it, this is Hinchliffe 25mm model. this time the color scheme is a medium blue tending towards Turquoise, and off white. Dental floss reins painted off white adorn the model once again. A rear view shows the four man crew figures better. An interesting short video on the Assyrian military. It is hard to believe that it has been 6 months since the last battle of our LANNES campaign, but Barry and I finally got the next battle on the table this past weekend. 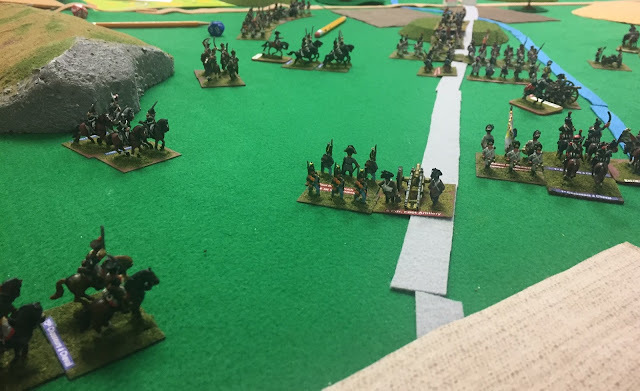 The scenario set up for this battle resulted in one of Barry's Commands being late to the battle, and when he rolled for which one it was, it was his largest and best Brigade. 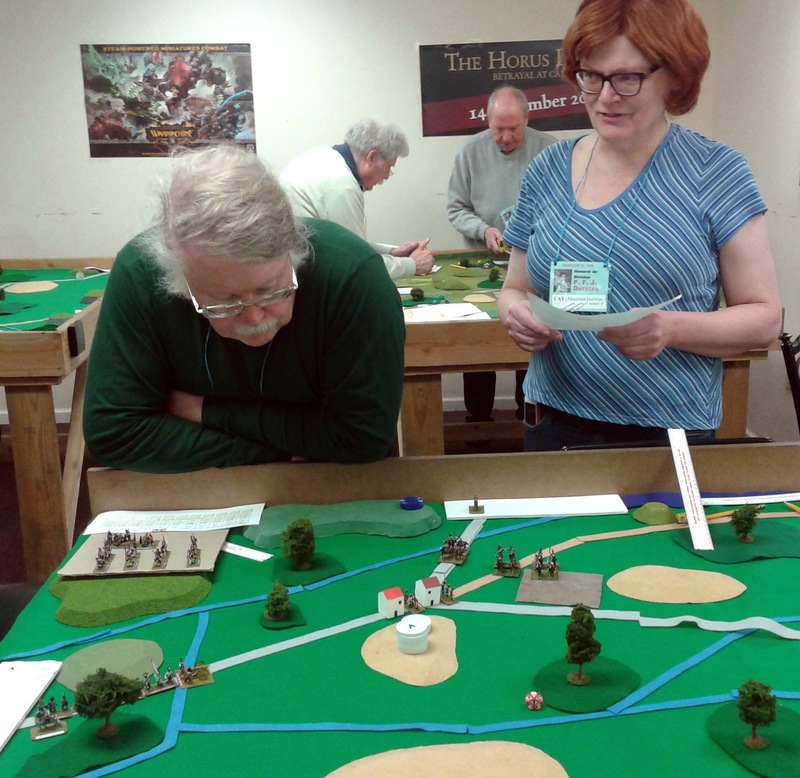 In partial compensation, one of his commands could deploy an extra 18" onto the table - note the Russians occupying the central forrest, known as Fitchwoods, from the nearby Fitchekowski farmstead. In addition, Fabian Faucon rolled high for starting Morale points, whilst Boris Badenov rolled... poorly. I had to deploy one of my command groups first, and opted for a fairly balanced deployment, planning to take advantage of my superiority in Cavalry and numbers. The Russian Artillery was know to be superior to mine, although my gunners were slowly starting to improve over the course of the campaign. Early on, Barry rolled up a "Triple Magic Move" with his right flank Dragoon brigade. Recall that Barry's Dragoons are by now world famous for their, uh, less than stellar performance characteristics. They charged my artillery battery in waves. The first unit was forced back with losses (" a rock and a chicken"! ), but it took the fire of both batteries to do so. Uh-oh! Sabers versus ramrods... not a favorable match up! Yep, scratch one French Artillery battery. On the other hands, the position of the Dragoons is now quite isolated. Indeed, at the next opportunity, my supporting infantry fire into the victorious Dragoons at close range "Putin THAT in your samovar and drink it, Vladimir!" The aftermath is seen here, with the Dragoons, feeling much more comfortable in their traditional deployment. On the opposite flank, my brigade of elite Hussars trots forward, Their supporting horse battery is lagging behind. Th recipient of their own Magic Move, the Hussars then charge forward into the lead Russian cavalry unit. Ah, Russian Dragoons - the Breakfast of Champions! Yet another charge by the Hussars shows that the Russian Uhlans are made of sterner stuff, routing one Hussar and throwing the other one back. However, the the charge allowed my supporting Horse battery to establish itself in a good position. Black Powder is touched off all across the Russian lines! Both French Legere units suffer heavy casualties in the process! "Run Away!" My left flank Chasseurs and Dragoons finally get their act together, running down the Routed Russians. 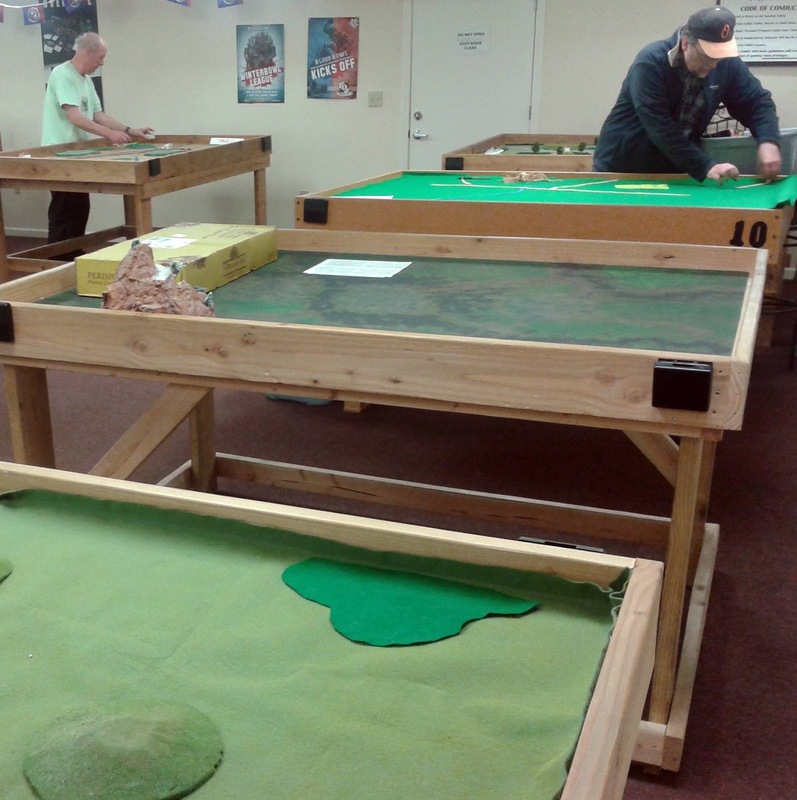 Overview of the action, as the central woods is being contested. Finding the Russian batteries "unloaded", two French battalions beat the pas de charge! The batteries are overrun, and my initial advance in to the woods is successful. Boris Badenov swears under his breath, and then shouts to his aids "Where are those good-for-nothing Grenadiers?" Meanwhile the French Horse Battery finds the range on the Uhlans, and its accurate fire sends them looking for the next coach to Siberia! The French press their advantage hard... perhaps too hard? Both armies catch their breath, frosty as it is in the frigid January air, and consolidate their positions. Fifes and drums playing a martial air, the Grenadiers at last make their appearance on the Russian Right. Bayonets are crossed in the Woods. Grenadiers and Jagers at the upper left. A plucky French Bayonet charge over runs the Russian 12 lber battery on the far Russian right, but the rest of the Russian Reserves move up smartly and smash 2 French Battalions. However, French Artillery fire routs 2 Russian battalions in return. The Russians are at zero Morale points and are handing chips to the French. Passing not one but two Army Morale checks, the Russians decide that discretion is the better part of valor, and begin to withdraw. The French with much of their infantry severely mauled, do not contest the withdrawal seriously, Their exhausted men commence seeking what shelter they can find from the long cold night of Polish winter; the footsore Russians are less fortunate. Here's the 2nd of 4 new Assyrian Heavy Chariots. I used the brown Micron ink pen for the detailing (pattern) on the yellow portions of the Cab, and the green pen for the green quivers affixed to the cab. The reins are made from the tape like form of Dental floss, painted a suitable color. Some more ink pen detailing on the fringes and the shield border. A coat of dark magic wash brought out the sculpting details on the wheels, ropes, and horse furniture nicely. About 10 days ago, my wife, our dog, and I were walking in neighboring Roxbury, on the former rail bed of the rail line that used to run to the Granite and Garnet quarry at Mine Hill a century and a half ago. As we walked the amazingly durable bed laid down so long ago, I was excited to find some red Trillium wildflowers. I hadn't seen one in in the wild for over 30 years, and there were a couple of spots where they were growing. This reclusive and ephemeral flower, nicknamed Red Wakerobin for it's early season blooms, and Stinking Benjamin (it is pollinated by flies and, like many similarly pollinated flowers [Jack in the Pulpit] it uses a rotting carrion fragrance to attract them). The blossoms were already becoming spent in mid May, so I didn't photograph them, but made note of their locations for next may. When we got back, I suspected that the cultivated Trillium that I had planted in the very shady front side of our home nearly 30 years ago might have gotten enough light and water this year to bloom, and that it would probably be a week or so behind its Forrest brethren. And so it was! I find the multiple threes of the flower and leaves (bracts) very satisfying aesthetically, with the red petals and green sepals making a sort of Star of David pattern. As the plants grow fairly low to the ground (12 to 18"), I have never had reason to sample their fragrance. It is best never to pick Trillium, as the flowers wilt almost immediately, and if you damage the three leaves, it may take years to recover, if ever. A different angle on a different day, taken to show the arrangement of the bracts (Leaves). Other varieties of Trillium found in North America can have white, pink, yellow, green or purple petals, but this red variety is the one that is native to New England... when you can find it! There is the first of 4 newly painted Assyrian Four-Horse Heavy Chariots. Like my earlier Assyrian Heavy Chariots, these are Hincliffe figures. The Hinchliffe line was especially prized for its equipment models. Obviously, I went for a light green and light orange motif for this chariot. My second time painting these models (25+ years later!) , I finally figured out exactly where the crew were supposed to fit (there are pegs on their feet and holes in the floor of the cab). These Hincliffe models are still available from Hinds Figures in the UK. The Assyrians were among the first armies to use cavalry effectively, although the status arm remained the Chariotry. I felt my Assyrian army needed some more heavy Cavalry. I was pretty sure I had a couple of packs of Foundry Assyrian Heavy Cavalry, purchased from the odds and ends bin of a vendor at Historicon more than 10 years ago, buried in the lead pile somewhere. And so it was! These Foundry figures still stack up very well against more recent sculpts. I chose a light green and dusty red color scheme for this unit, with some off white accents. The dark magic wash worked very well to pick out the detailing of these Perry sculpted troops. They will make a nice addition to the forces of Assyria. The capitol of the later Assyrian empire was at Nineveh, on the Tigris river... opposite the modern day city of Mosul, the scene of continued intense fighting in Iraq. At its peak, from about 700 to 627 BC, it is thought to have been the largest city in the world, with a population o up to 150,00 persons. I entered the table enroute to Laibach. I immediately encountered Austrian resistance from Zagreb and wound up having additional Austrians entering the table immediately to my rear. I hope that the following recollection helps with your documentation of the campaign. In my case, as Marmont, I was focused on fighting my way to Laibach after encountering a minor town occupied by Austrian landwehr and then by significant Austrian resistance (Mike) arriving from Zagreb. While heavily engaged, a different Austrian force suddenly appeared to my rear, causing me to feel a bit like Mack at Ulm! Fortunately, this new threat was being hotly pursued by a large French force (Vic, Jim, and ?) and, after entering, we together successfully drove the Austrians back towards Zagreb despite their brilliantly fought rearguard (by Kaz), reminiscent of Ney in Russia." 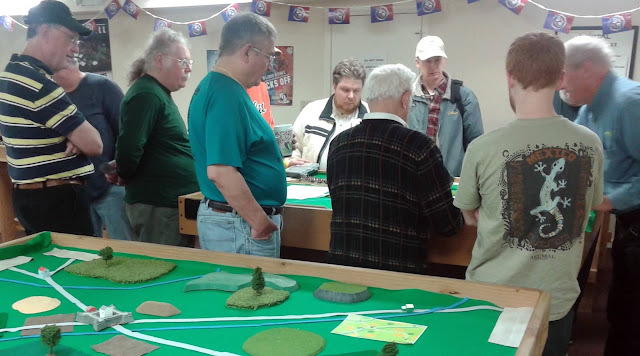 Thanks again for all of your incredible effort in creating this fantastic wargaming experience. I hope to participate in future games, but I will definitiely pre-register so that I can receive orders and other situational materials that would help me be more effective - and perhaps provide a more useful writeup. communications with Napoleon's Grand Armee, who at that point was operating some 100 miles further north along the Danube River (see dotted line on map showing MacDonald's expected route). Once reaching Salzburg MacDonald had the option to hold for further orders or proceed onto Judenburg to join in the campaign in driving the Austrians out of Austria. 2) On approaching Innsbruck, the French had a minor clash with Jellaic's rear guard, Jellaic at that point being most intent on beating a hasty retreat and disappearing southwards towards Villach. MacDonald, masking his movements from Jellaic's scouts, proceeded with his mission westwards to Salzburg. 3) MacDonald encounters Collerado, who was apparently marching away, but on seeing the French instead decides to turn and cover Salzburg. MacDonald immediately attacks from the march. Voila! The Austrians, though caught initially marching away from the French, need to deploy from march to their rear. MacDonald seeing the nature of the ground and of the Austrian deployment, formulates a plan intent on forcing Collerado into a vulnerable "L" shaped frontage. The French plan is to immediately deploy artillery forward to occupy Collerado's developing center, while simultaneously the French cavalry and a pair of supporting infantry go on a wide flanking maneuver to the left, thereby turning and constraining the deployment of the Austrian right. The French artillery pound Collerado's center (with the Austrian return fire somewhat lackluster in return), while the French flanking maneuver, coordinated with a press of French infantry on the right, forces the Austrian's into the L shape MacDonald desires. This leaves Austrian guns partially masked by much of their own forces while the French guns have complete free play. steps lost at one go!) This opens the way for the Austrians to counter-attack on that flank. However, the French infantry on the left effect a masterful defense, tying up and delaying any effective help for the Austrians from that flank. Meanwhile the dominance of the French artillery in the center (two mediums and a 4 lb all pressing into canister range), combine with the pressure from charging French on the right, make a mash of the opposing Austrians. 4) As total Austrian collapse seems inevitable, timely local revolutionaries arrive. Sacrébleu!! To buy time to finish crushing the surviving Austrians, MacDonald now recovers and rallies his cavalry, which he sends off in assault to delay the arrival of the fresh Austrians. Austrians, MacDonald calls off further attack and organizes a rear guard to cover a fallback to Innsbruck for resting and reorganizing his weary troops. His forces, though victorious are rather roughed up themselves [being down some 27 morale steps out of a total of 60]. defensive front to resist the expected Austrian counter-attack. ascertaining it held but by a weak enemy garrison. 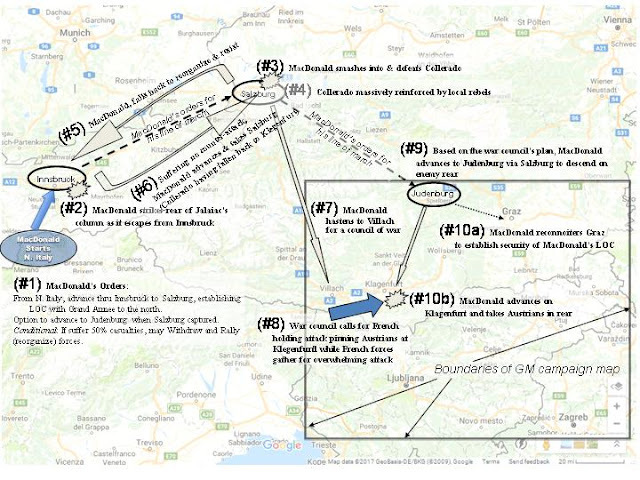 7) MacDonald then rushed southwards (from Salzburg) to Villach to join major French forces expected there (based on prior communications with Eugene). 8) A council of war ensued at Villach. Whilst in conference, French reconnaissance located a major Austrian defense at Klegfurt, centered on the fort at that location. Seeing a frontal attack likely ineffective, even with the massed forces of four commands, we opted for Durrette and Pacthod to demonstrate at Klegfurt, tying down the Austrians there and giving Eugene time to arrive in support and giving MacDonald time to seek a way into the rear of the Klegfurt position. 9) MacDonald retraced his steps back to Salzburg and then on to Judenburg, securing his own LOC by quickly disposing the lone enemy garrison unit defending that town. and there was no sign of an Austrian LOC present [i.e., there were no LOC chips on the table indicating that any kind of Austrian LOC ran through Graz], MacDonald opted to stick with the council of war's original plans and descend on Klegfurt. Pacthod and Durrette might crush the main Austrian defense. 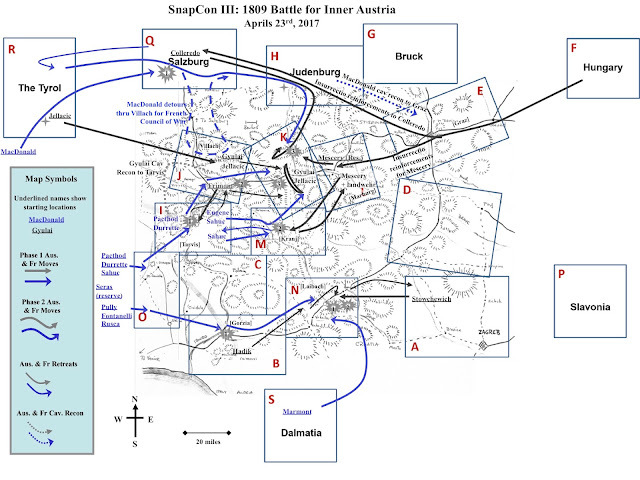 Consequently, MacDonald sent out a screen of infantry and cavalry to delay the Archduke while the bulk of MacDonald's forces assumed a strong defensive position with guns on high ground with infantry having well-anchored flanks in front. In the course of his travels, MacDonalds forces fully traversed some five tables, visited seven, had fights on three tables including in particular a heck of a knock down drag out fight with Collerado, and was proceeding to have the same with the Archduke. Started the day off well, my lighter calvary was ahead of the main force. On the very first table, we immediately ran into two Austrian forces, one of which turned tail and ran and the other in a road formation. Even with my quick calvary, the dice were not on my side, as a few horsemen went down under infantry fire. The main French force helped initialize combat while my lighter troops flanked around back. We crushed most of that Austrian force but because they were on the edge some of the army escaped. I continued my orders to scout to another town; I had half my original force left. I found one small band of Austrians who were partying it up in a town, so I advanced my 4 lb artillery and bombed them out, but I had been noticed. In a last ditch effort, my calvary gave their lives attempting to finalize their orders, but fortunately one unit of my Elite Hussars escaped the bloodbath. All seemed lost, but Prince Eugene suddenly appeared, giving my light calvary squad hope! I attached to the Prince's larger force and marched toward the final battle, where about 8 other players were fighting for control of a fort. Entering the field, multiple French calvary units joined up and charged en masse into the enemy, the final casualties being.... well we ran out of time before then. All in all, my light calvary squad lasted much much longer than they should have, due to some well-timed lucky die rolls and support from the Prince. I had fun, and though I basically got demolished, I upheld the honor of the French and went down swinging! This report is to give you a brief scenario of the deployment of the “Pully” Dragoon cavalry during our recent battle against the Army of Inner Austria. The orders I received from Prince Eugene, Viceroy of Italy were to have my cavalry scout ahead through the cities of Gorizia to Laiback and then march on the Celje to locate enemy troops. My elite Dragoons were to scout ahead of Fontanelli and Rusco’s forces. Once the cavalry located the enemy, Fontanelli and Rusco’s forces would assist the Pully Dragoons in the destruction of the Austrian Army. The cavalry that I commanded was part of the army commanded by Prince Eugene, Viceroy of Italy. My instructions were to enter my Dragoons through a deployment area that faced the enemy. A portion of the Austrian Army was strategically placed and firmly entrenched in an area commanding a bridge and rivers. Their forces were also backed up with artillery strategically placed on several hills. The course of action that I took, after testing their defenses, was a direct assault on their positions. My brave elite Dragoons raced forward and attacked the Austrian formidable positions. Fortanelli and Rusco forces were still stationed behind my cavalry. They could not enter the battle until my Dragoons engaged the enemy forces and cleared the way for them. I continued to make a series of strategic decisions during our direct attack at the bridge, which allowed my cavalry to move forward. Once the cavalry was over the river and bridge, we flanked the enemy’s artillery and position. The pressure of the attack forced the enemy to withdraw their troops and begin their retreat. Their artillery was neutralized. This action allowed Fontaneili and Rusco to bring their forces forward and enter the battle. Once all our forces were over the bridge, our superior strength forced the enemy to continue their withdraw and retreat. The course of the battle in our area was stabilized and the powerful force of Fontanelli, Rusco, and Pully compelled the Austrians units to retreat and leave the field of battle. I played (or, rather, misplayed) as FM Colleredo. I had set up my units in road-march mode, expecting orders to march. Unfortunately, I was attacked before I received any orders. I quickly deployed, but suffered greatly as James used his full strength against unsupported units of mine. After that, I could provide support, but not great strength, as I was sent to help in other areas. I was stationed in Villach area with FML Frimont. I sent my Cavalry to scout the SW road. They spotted a French Cavalry Corp and two French Inf Corp. With Arty. I also saw FML Frimont Division arrive on a different road. I sent a message to Arch Duke John informing him about what I have seen. I was preparing to move my Division to support FML Frimont Div. But The Arch Duke Ordered me to move my force to Klagenfurt. Also told me that FML Jellacic Would be following my forces there and we should set up a defensive line. I did send a message to FML Frimont that I was ordered away. FML Jellacic and I set up a defensive line and waited. I received reports from FML Mescery about what was going on in his sectors. After a long wait. FML Frimont came into our area with what was left of his Division and told us what had happened. Then he proceeded to move away. Soon after him two huge French Inf Corps with Arty and Calavry attached showed up and engaged us. I did recognized the colors from what I had spotted earlier. AS we engaged the two French Corps. Another Corp arrived on a different road. It was their Guard. Then FML Colleredo Arrived with what was left of his Division on a different road. And behind him came another French Corp. FML Mescery Came on the only road left we controlled and went to engage The French Corp That followed Colleredo. FML Jellacic engaged the French Corp on out right while I engaged the one on the left. Then also had to take on the Guard. Night fell and it was over. Thanks to everyone for playing in the game, as well as extra thanks to those who set it up. A great experience! It was really nice to have a ‘campaign’ level miniatures game – where it was more important to keep the overall situation in mind instead of just winning on a single battlefield. Unfortunately, the event has set my creative engines running. As several people suggested, we may soon see a Luftwaffe 1946 multi-table air engagement. Thanks for the inspiration! In a sense, the whole blog on this event is my report, but the most interesting paet of the campaign from my standpoint was the opening decision on which strategy to pursue starting isolated and incommunicado at Innsbruck. Marching to Munich to try to reunite with my Corps (Hiller) would obviously take me out of the game, and would have little chance of making any major impact on events South of the Danube, so that wasn't a serious option. I knew enough abut the campaign that marching on Italy itself could easily have lead to my being cut off from the main body of Austriaan troops without contributing my badly needed men. Historically, Jellacic marched on Tarvis and was crushed there by Eugene's forces, an action I have gamed before. In the event, had I chosen that option, MacDOnald and I would have fought almost immediately at Innsbruck - assuming that he didn't pull back, It was suggestyed that Tyrolean rebels would swell my forces if I remained at Innsbruck, but without much indication of how many or how long that would take to happen. Most likely had mac Donald and I clashed at Innsbruck, at least one Fvrench Division could have marched North from Tarvis to cut me off. What effect that would have on Coloredo in Salzburg would be unclear. I considered marching on Salzburg to join with Coloredo, which would be the safest route. However, it was clear the main fight would likely occur on the Tarvis - Villach - Klagenfurt - Graz axis, and that route would likely take my troops a long time before they could arrive there to influence events. Thus I marched on Villach, which still seems to have be to be the best choice. I probably could have started in the deployment zone of the Villach road and thus exited the table as MacDonald was exiting, but it wasn't clear to me that was permissible. In the event, I was content to lose a single unit of Tyrolean insurgents as the price to slip between the various oncoming French forces. The long lull at Klagenfurt allowed me to take a great many pictures, even though I often didn't really understand exactly what was happening where (which is the whole idea of the thing!). I would have loved to have played another hour at Klagenfurt, although Pacthod (Mark) already had me on the ropes after his charge! I can't wait to do another! I am strongly considering doing a Campaign in a Day at Historicon 20018 in Lancaster, using my 28mm troops, and set in Spain. Subject to change, and space/table availability at the site, for sure! The messages arrived with irregularity at my headquarters in Villach. Apparently, we Austrian field marshals proved slow to pick up the mantle of overall command. True, the Emperor appointed Archduke John as overall command, but he was looking for a surrogate and not one could be found. James (right) briefs the players on the rules. Pity. It would be a plum assignment. Then again, maybe not. Prince Eugene led a combined Franco-Italian command that outnumbered us all along the Austro-Hungarian-Italian frontier. Initial reports pegged the French at a concentrated 27,000, plus another 7,000 of the Army of Italy in close proximity up north, and another 7,000 in the Army of Dalmatia down south. As for us Austrians, I commanded only 5,000 plus another 5,500 under A. Gyulai -- 10,500 at our advanced position at Villach. Hadik had another 5,000 at Gorizia in the south and Jellacic (7,000) and Colleredo (6,000) sat up near Salzburg. Stowchewich sat in Zagreb with only 4,000. Mescery was our big central reserve of 3,000 at Marburg. That's our scattered 35,500 versus 41,000. Such was the setting of another Snappy Nappy Campaign-in-a-Day hosted at SnapCon III at The Portal gaming store in Manchester, CT. 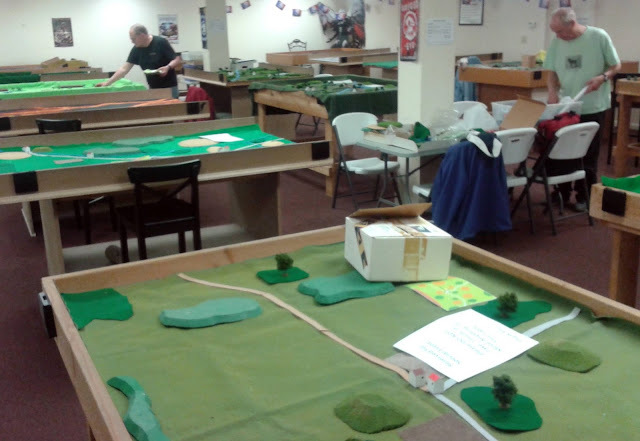 This year's GameMaster -- Dan -- re-created the 1809 Italian campaign across 17 tables (each four feet by six feet). The idea is to separate players across multiple tables to reduce player omniscience and enhance fog of war. This year, we had 16 players in total. Players communicate through the GM with written messages. The C-in-C issues orders to commanders, who can adjust them 'up or down' the hierarchy of orders at the beginning of each turn. Thus, players get some flexibility of doing something based on their on-the-spot observations instead of slavishly following out of date orders from a C-in-C who is on some faraway table. Saturday night set-up: James (left) and Dan on some of the 17 tables we used. Original Snappy Nappy is written at a corp scale -- each infantry or cavalry unit (two stands) is a brigade, while an artillery stand is about 24 guns. Due to the fewer number of troops in the Italian front, Dan created a Regimental Snappy Nappy variant, where each infantry and cavalry unit is a regiment and the artillery is a battery. Each player commands a division. It's about 80% the same -- the difference lies in various modifiers. You still use d10s, two stands make up a infantry or cavalry unit, and when you take a Morale Check, you roll until you pass or rout off the table. Each unit takes a certain amount of damage (I prefer roster sheets for greater fog of war, but others opted to put casualty rings on the stands so they wouldn't have to use the roster sheets), with diminished capacity as damage increases. Alan runs a great Snappy Nappy Yahoo group that has the quick reference sheets for Dan's Regimental Snappy Nappy in the Files section. You'll also find an After Action Report (including OOB) about a one-table Battle of Raab run at Cold Wars. There's also SN errata that's popped up over the years. Join up and download. Greg (left) and James setting up tables. 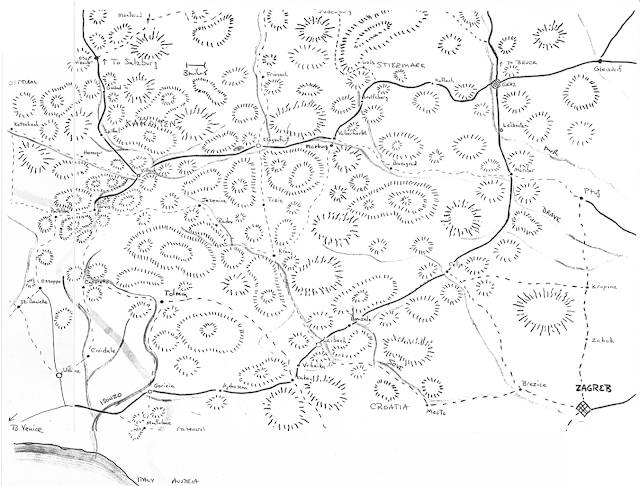 Peter runs a BlundersontheDanube blog with all the previous SnapCon campaign-in-a-day games, including OOBs, maps, and AAR recaps. Lots and lots of photos, including table by table. Thanks to Peter, James, and Greg for terrain and extras and to Greg and James for Saturday night setup. Veteran SN players know that the key to such a freewheeling game is movement and communication. With so many tables, each side faces uncertainty about who is going where and there is a real possibility that an enemy can find a gap on an uncovered table. Sure, you can see a player on your side across the room, but you don't know exactly where he is in the grand scheme of tables. Or worse, you cringe when you look across the room -- that commander never held a flank yet. Hence, scouting is important. One of the smartest moves a player can make, even on the defense, is to send a unit off the edge of the table to take a peek down the road. A couple SnapCons ago, James came up with the deployment zone concept. When you move a unit off a table, it ends up on a new table in a deployment zone. It can't be attacked in, nor attack out of, this zone. 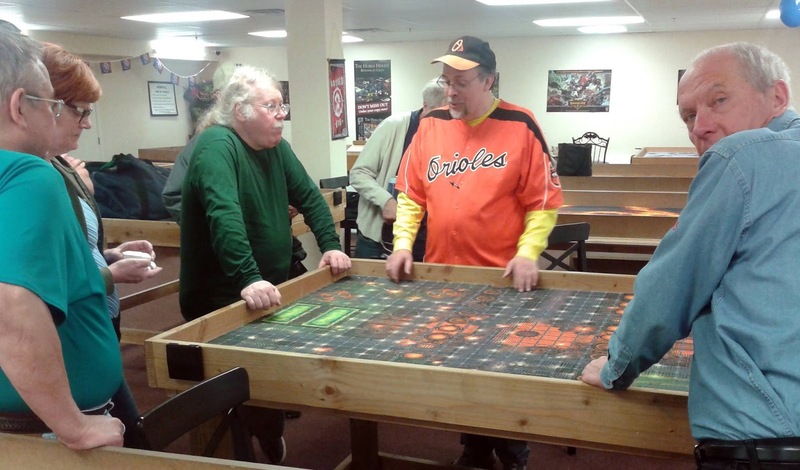 The other side's forces on this new table get one turn of reaction. After that, the unit or units in the deployment zone make a decision whether to kick or stick. They either make an immediate move back to their original table (kick) or stay on the new table and proceed with the turn sequence per usual (stick). It's one of those ideas I wish I had thought of and it works well. Being but one division of a whole, I did not know the plan crafted by Archduke John, but Field Marshal Mescery took the lead in crafting a strategy. The overall goal, passed down by Archduke Charles, was to keep the French off his southern flank while he dealt with Napoleon. Either we had to fall back slowly, gathering the hordes of ill-trained, but numerous, Landwehr and Insurrectionist forces and make a stand somewhere between the Italian and Hungarian borders, or, take a more aggressive stance and keep the French and Italians as far away as possible but accepting the losses that our outnumbered forces would suffer. As I understood it, Mescery proposed a forward defense with the goal of preventing the French from using numerical superiority to slide through gaps. I agreed, but noted that we needed to scout well to detect and bottle up any Franco-Italian intrusions. Pondering the map, I asked: What would Prince Eugene do? To my mind, the French would likely push up the two main turnpikes just to make sure we garrisoned them. But I noticed a central secondary road from Tarvis through Jessenice to the central crossroads of Kranj and a southern secondary road from Caporetto through Tolmin and south to Kake. The latter could very well cut off Hadik while the former could cut off most of the forward-deployed Austrian force. We tried a Lines of Communication (LoC) rule for the first time. James had planned to use it last campaign game, but decided not to use it in order to speed up set up. Dan decided to use it for this game. The players didn't know exactly what would happen if they were cut off from their LoC. As it turned out, LoCs were kept intact through the game -- perhaps because we players paid attention to it, or perhaps because it was not needed. Years ago, I used a simple supply rule for an 1812 Invasion of Russia Snappy Nappy Campaign-in-a-Day that used barrels to denote supply centers. Stay within 12 inches of any barrel and no ill effects. Go beyond and start picking up Morale Checks (attrition). It didn't make much difference in that game, too. Again, whether from player attention or unnecessary rule, I don't know. In the end, orders came down to me and A. Gyulai from Archduke John: "Garrison Villach (Defend Order), preparing to move to Klagenfurt. Report any enemy. Conditional Order: When outnumbered, disengage and move to Klagenfurt (Maneuver Order), but leave a garrison or rear guard." The first thing to do was scout, so Gyulai sent his cavalry westward and I opted to change my orders from Defend to Maneuver, allowing me to head to Tarvis. I knew, just knew the Frenchies would try to sneak by us to Jesenice and Kranj. I left a veteran unit in garrison at Villach and headed southwest towards Tarvis. Sure enough, the Frenchies were on the move. However, I mistook their direction as South, heading towards Caporetto. The next turn, as I continued marching to Tarvis, I realized my mistake. They were heading towards Tarvis. At this point, the scouting cavalry of Gyulai appeared across table, only to see an entire French cavalry division (er, brigade, but I called it a division) of five regiments and an artillery battery swing in their direction while two infantry divisions marched towards me. I realized I would be unable to reach Tarvis and install a garrison, so I changed my orders back to Defend and started to shake off the road and deploy. It was one on three, but I figured I was good for a while, even though I didn't have any cavalry. Disaster number one: New orders came from Archduke John -- maneuver back to Villach. What! Now? The French cavalry division was hot-hoofing it to my right and the cavalry regiments of the two Franco-Italian infantry divisions were swinging to my left. Without the completion of my deployment, I would have one end of my column in the cavalry jaws. Grumbling, I recalled my deployment and got back in road march formation on the road. I had a head start and just enough space to use it. Disaster number two: The dreaded double turn. SN uses an initiative system at the beginning of every turn. High roller (+ or - commander modifiers) moves first. On this Tarvis table, our rolls made me go first, then the French, until the French rolled far higher and grabbed the initiative -- just at the right moment of me being in road column. The French cavalry pounced as best it could. One attacked one of my 6-lber batteries, the others hit the nearest infantry, the cavalry division unlimbered artillery while the horse raced to cut me off from the exit road. Frimont (red arrow) takes on three times his numbers at Tarvis. I was lucky. Very lucky. Exceptionally lucky. Mark, Maureen, and Caleb shook their fists at my dice, their dice, and dice at the other end of the game store. In SN, rolling high is always rolling good. Their dice puttered and sputtered in the low digits. My rolls soared. That artillery of mine should have been obliterated because catching a unit in road column is an automatic victory -- you just have to roll how bad. Not bad at all. I scooched back an inch after three melee rolls. As the turns rolled by, I shunted units into a semblance of a line, but always outflanked by the cavalry. Caleb felt the canister of my massive 12-lber battery -- and proceeded to roll so many morale fails (hits in SN cause Morale Checks) three units fled off the table never to return while a fourth came within one level of following them. Even while caught in the jaws of cavalry on my flank and infantry to my front, the dice proved so frustrating to the French, they grabbed my blue die thinking it was loaded -- it was not. They could roll 1s and 2s on it just as well as on their multicolored dice. Naturally, I used their dice and rolled well, well above average. ‘Defacto screwed’: Frimont seeks the sanctuary of the deployment zone (bottom right) as French cavalry encircle his command. Note the French cavalry (blue name tags, right) smacked my 12-pdr (with Frimont attached) and forced a retreat. Beyond the 12-pder, French infantry roll up my front line. I had five infantry units and three artillery units at start, minus Infantry Regt 43 that I left at Villach. 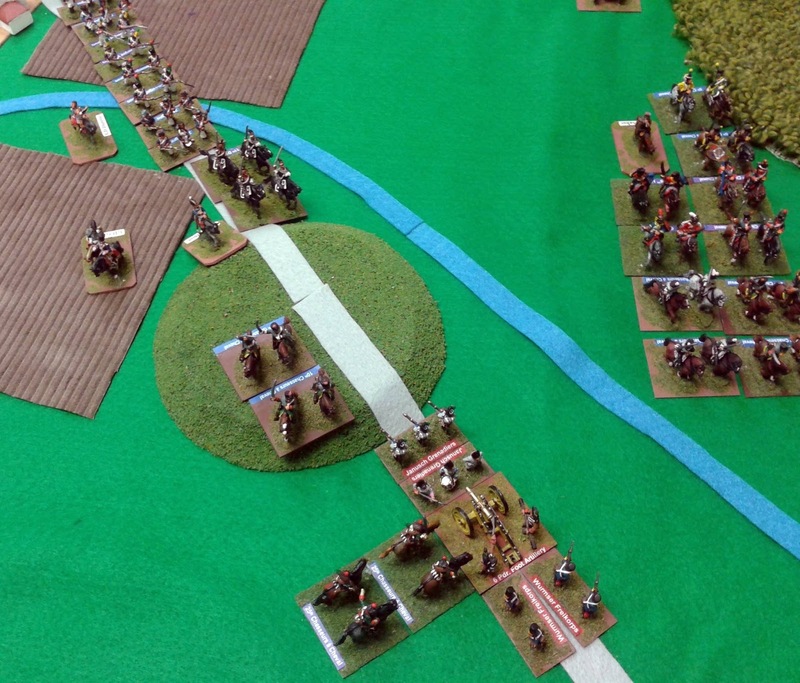 These seven units stymied the French and Italians for hours of game time. I entered the Tarvis table at 11:03. At 11:51 came the double turn. At 12:19 I sent the following message to Archduke John: "Rearguard holding up three French divisions. May not make it back to Villach, but delaying as best as possible." Yes, I knew I was in deep trouble. At 1:02 I sent another message: "Holding, but cut off now from heading to Villach barring French error." A most crowning achievement was when General Sahuc (Caleb) led a cavalry charge against the flank of my 12-lber battery and by dint of fortune, I only backed off an inch. The resulting canister attack put a hole in Sahuc's hat (when a player rolls a natural 1 on a Morale Check with a leader attached, the player rolls a d10 on the Leader Loss chart). In this case, the roll was a 10 -- hole in hat. On the next turn, Sahuc rolled a natural 1 on a Morale Check and this time rolled a 1 on Leader Loss table -- killed. As French General Maureen quipped, "Hole in hat, hole in head!" Note that an "aide" to Prince Eugene (on the same table) would assume command of the cavalry division, but Caleb would continue to command his depleted command. During the battle, I also rolled a 1 for a Morale Check while Frimont was attached to that unit, and also rolled the hole in hat result on the Leader Loss Table. Still I held on. At 1:56, I sent: "Exiting table back to Villach. Rearguard overwhelmed. Will do best I can at Villach." That's three hours of intense gaming between the four of us. I should have fallen in half the time. Hence, I nicknamed the action the "Frimont Freeze." Frimont leads his weary troops to outskirts of Villach and its garrison of veteran infantry. Frimont kept going off right of photo to Klagenfurt, but the garrison put up a heckuva fight. My force was split in two -- the first with two infantry and a 6-lber artillery battery slowly giving ground near the hills of Tarvis and the second with the rest slowly inching backwards along the road. Archduke responded to my 1:56 message with: "Retreat to Klagenfurt -- leave rearguard at Villach." Well, I had been working towards that goal anyway, and three of my units (two infantry and a 6-lber battery) were close to the exit spot, so, off I went. I didn't always roll high, so my leading 6-lber battery fell, followed by the 12-lber. The two leading infantry units, including the elite Chimani Grenadiers, also fell. Only three units made it back to the Villach table. Foreground: Mark (left) and Maureen enter the Villach table to confront the garrison. At left, Frimont will defend the hill and stream for a turn or two before fleeing. The white stack of chips on the hill were used as LoC markers on roads. The rectangular white areas are deployment zones. Background: Another battle somewhere else along the frontier. Imagine my surprise to find myself alone. No A. Gyulai to greet me. As it turned out, he had sent a message to me way back at 11:34 saying he was heading for Klagenfurt. I swore I never received it, yet looking back through my messages, I did indeed receive it at some point -- likely so involved in getting swarmed at Tarvis I completely forgot about it. My bad. The French and Italians, after a short pause, followed up on the Villach table. I passed Villach on the turnpike to Klagenfurt when I sent a message at 2:40: "They mass against Villach -- not that I'll have much to do about it. Cavalry streaming around and heading towards turnpike to Klagenfurt." The French (left) get excited about finally arriving on the Klagenfurt table. The Laibach table is behind them. I had set up my three units on a hill behind streams to protect the exit. Ah, but my lucky star remained bright. Remember, I had left a garrison at Villach. Turn after turn, it remained in Villach, unperturbed by the French. The French brought up one artillery battery, then added a infantry unit, then the next turn up came another artillery unit, and then another two infantry units, and then finally a third artillery and yet another infantry unit. My veteran Infantry Regiment 43 "Simbschen" hung in there, foiling attacks and shrugging off all but the last pounding, where it was forced out, Shaken, of Villach. I thought for a moment about what I could do. I could NOT get back into town because it was an inch too far. I could not run, because cavalry swarmed the far flanks making sure my three-unit force stayed behind the streams. So, I counterattacked into the teeth of the French. Simbschen shrugged off the fire, but its depleted state proved a liability and it was swept away. Now I was in for a real surprise -- the whole bloody Austrian army was in a crescent line around the fortress of Klagenfurt. That was all I needed to see. My tired soldiers, no, my stalwart heroes of Tarvis, could take comfort in the delay inflicted upon the French. Hey, hey, most of the gang’s all here at the Klagenfurt table. Left (sitting) is Caleb (Sahuc), who fought long and hard at Tarvis. Marty (checked shirt) in foreground is Mescery, whose reserve arrived to help balance the forces. Real time was 4:17pm. I passed them through the lines and east of Klagenfurt, where I sent a message to Archduke John at 3:07: "Request permission to head to Graz as final reserve to prevent any French outflanking." You see, I still had a sneaking suspicion that the French were on some sort of flanking attack. You also have to understand I had no information about any other of the Austrian divisions. I expected to see Gyulai at Villach, but found him and others at Klagenfurt. I had no idea what happened in the north or south. I just knew it was time to stand down. The French, after a turn or two, followed me onto the Klagenfurt table, but did not press too closely once they saw the force defending the fortress. They came back, of course, en masse, with additional divisions arriving on other roads. The Frimont Flee: Frimont (red) held up the French just a little more at Villach before fleeing past Klagenfurt to Marburg. Archduke John appeared at Klagenfurt and ordered me back to Marburg to pick up Landwehr and Insurrectionist troops to fill out my command. I remained unengaged in the reserve until the game ended at 5:15 or so. Still plenty of fight left on the Klagenfurt table even after two hours. Mescery, released from reserve, proved a shock to the French and helped stem the French tide. In the South, the French were hammering the Austrians on the Laibach table -- apparently, the Austrians put up a spirited fight as well. From 11am to 3pm, I recorded 30 turns -- most of them maneuver and combat on one table or another -- that's about eight minutes a turn. I don't know how many turns were on the Klagenfurt table after I left, but I would make a guess of 10 to 12 or so, more or less, as more players were on the Klagenfurt table. It's nice to see a campaign evolve from a series of smaller battles to one or two big battles at the end -- rather Napoleonic, don'tcha think? As for the overall winning side, I'll leave that determination to GM Dan. To my mind, we kept the French far away from Raab...indeed, even far away from Graz. So that might count as a victory for the Austrians. As for losses, well, I don't know about the end result. I know my command lost five of eight units and I know I eliminated three light cavalry units and a General. Debrief. GM Dan (Orioles) recaps the game for those that remained after cleanup. The following is a compilation of French and Austrian messages exchanged during the game between commanders in chronological order. Aside from insignificant corrected typos, the messages are reproduced as written. You can appreciate some of the action, and commanders' reactions, at the tabletop. Snappy Nappy rewards communication, or at least it can if the C-in-C absorbs the information, filters out incorrect information, and alters his plan accordingly. In a Snappy Nappy campaign-in-a-day game, the umpire controls message delivery, and this can vary depending on distance, roads, and enemy dispositions. That's why a time stamp is important. It gives the umpire a start time in the delivery process and offers the recipient a clue about the immediacy of the information. In this game, the first message is sent at 10:45am. The game ended around 5:15pm. This lists 68 messages, although others may have been secreted in pockets or papers during the battle and lost to posterity at game's end. For my own command, Frimont, I sent 11 messages between 11:03 and 3:07 (I had passed into reserve at 3:00), or almost 3 per hour. Players find that when the action heats up, the message flow ebbs. During my four hours of battle, I did 30 turns, or an average of about 8 minutes per turn. This game moves right along, even when I stopped to take a photo and e-mail it to myself. The entire game was about 40 or so turns long. Format: Time [F = French, A = Austrian] From/To: Message. 10:45 [A] From Mescery to A. Gyulai: I am moving with my entire force to Kranj as ordered. Klagenfurt has its own garrison. I will raise Landwehr as encountered to join my command. 10:45 [A] From Mescery to Hadik: Moving with my entire command to Kranj. Klagenfurt has its own garrison. I will raise Landwehr as encountered to join my command. 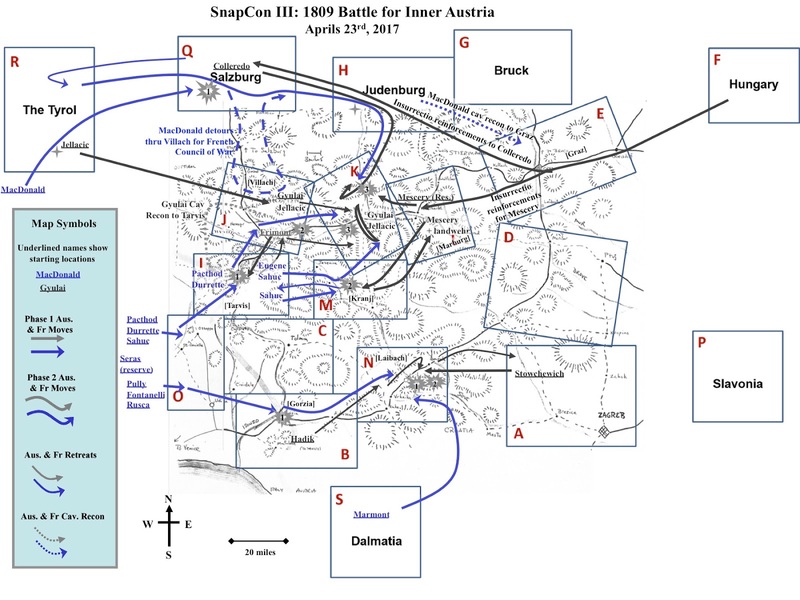 11:00 [A] From Jellacic to Archduke John: Starting to leave Insbruck table, but McDonald has arrived via road Osseppo -- one light cavalry, six infantry, three artillery. I continue down road to Villach. 11:03 [A] From Frimont to Archduke John: Three divisions of French heading towards Osseppo from Pontibba. A. Gyulai can confirm. 11:03 [A] From A. Gyulai to Archduke John: Sent dragoons to scout and spotted cavalry division and two infantry divisions near Tarvis. What do you want me to do? 11:05 [F] From MacDonald to Eugene: Have encountered Jellacic retreating from Innsbruck along Innsbruck-Villach road. Jellacic has six infantry, two cavalry, and three artillery. Am proceeding on my assignment.
? [F] From Eugene to MacDonald: Attack Jellacic target of opportunity. 11:27 [A] From Frimont to Archduke John: Correction - French Lt. Cavalry division towards Villach via Pontibba. French infantry division towards Tarvis. French infantrty division towards Pontibba. 11:34 [A] from A. Gyulai to Frimont: I have been ordered to fall back to Klagenfurt. Jellecic is following me. 11:40 [A] From Archduke John to Frimont: Pull back to Villach and then to Klagenfurt. 11:41 [A] From Frimont to Archduke John: Am complying with falling back to Villach. French heading towards Kranj. 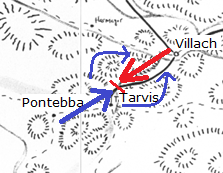 11:42 [F] From Sahuc and Grenier to Eugene: At Tarvis, Austrians run away. We are marching to Villach. 11:45 [A] From Mescery to A. Gyulai: I have been ordered to Marburg by the Archduke. Likely arrival in 3 to 4 turns. garrison left at Kranj. 11:45 [A] From Mescery to Hadik: I have been ordered to Marburg, will leave vicinity of Kranj in one to two hours. A Landwehr regt will garrison Kranj. 11:45 [A] From Mescery to Archduke John: Orders received. Moving to Marburg. Local Landwehr garrison left at Kranj. 11:47 [A] From Colleredo to Archduke John: An enemy division has arrived on road from Innsbruck. We have deployed to defend west of Salzberg. 11:47 [F] From MacDonald to Eugene: Have secured Innsbruck. Have encountered Colleredo at salzburg and am preparing to destroy him.
? [F] From Eugene to MacDonald: Do so, then move towards Villach. 11:51 [A] From Frimont to Archduke John: Attacked by dint of fate. Switching to Defending zone. French heading to Villach.
? [A] From Archduke John to Frimont: Use best judgment, but strive to disengage. 11:51 [F] From Sahuc and Grenier to Pully: At Tarvis. Chasing Austrian forces back to Villach. 12:00 [A] From Archduke John to Colleredo: Defend as best you can. 12:05 [A] From Jellacic to Mescery: I am at Klagenfurt with A Gyulai. We have adopted defensive position at Klagenfurt. Watching approaches from Villach and Kranj. 12:19 [A] From Frimont to Archduke John: Rearguard holding up three French divisions. May not make it back to Villach, but delaying as best as possible. 12:29 [A] From Frimont to Archduke John: Rearguard is falling. Being cut off. Looks grim. 12:30 [A] From Mescery to A. Gyulai: I have garrisoned area betwen Marburg and Voberharht with the Light division. A Landwehr infantry regiment and a cavalry regiment have joined my command. I am facing towards Klagenfurt.
? [A] From Archduke John to Colleredo: After enemy retreats from area (off table) or greater than 18 inches, adopt Rally order to rally all your troops. Then on time to Judenburg.
? [A] From Archduke John to Hadik: Fall back to Laibach (Maneuver). Leave a rear guard to delay French. 12:35 [A] From Jellacic to Mescery: I remain in defensive position at Klagenfurt with A. Gyulai. No sign of enemy here, yet rumor has it Frimont is being destroyed at Tarvis. 12:45 [A] From Mescery to Archduke John: Per your orders, I am holding between Marburg and Voberharht, facing Klagenfurt. I have been joined by a local infantry regt and a cavalry regt. Awaiting further orders. 1:00 [A] From Mescery to Hadik: Archduke Joseph has arrived in the vicinity of Voberharht with Hungarian cavalry. His intentions are unclear at this time. 1:02 [A] From Frimont to Archduke John: Holding, but cut off now from heading to Villach barring French error. 1:30 [A] From Mescery to Hadik: I have been joined by one infantry and eight cavalry units from the Hungarian reserve. I am currently holding in Marburg area as a reserve. 1:30 [A] From Mescery to A. Gyulai: I have been joined by eight cavalry and one infantry regiment from Hungary. I am holding a reserve near Marburg. 1:45 [A] From Jellacic to Mescery: Status quo at Klagenfurt. Per the orders of the Archduke John, we remain on the defensive. No sign of enemy -- yet. 1:54 [A] From Colleredo to Archduke John: Location Salzburg. French are in retreat to Innsbruck thanks to timely arrival of Landwehr and Insurrectionists. My original command is shattered. French division is still effective, if given time to recover. 1:55 [F] From MacDonald to Eugene: Have smashed Colleredo at Salzburg, but he has been massively reinforced. My forces are at 50% strength. Arriving Austrian forces are three cavalry, two infantry, one artillery. I am withdrawing to Innsbruck to reorganize and will attack to take Innsbruck.
? [F] From Eugene to MacDonald: You have done your duty this day. Regroup and know Durette, Pacthod and Seras move to Villach post haste. Should the new Austrian force appear, we will destroy them. 1:56 [A] From Frimont to Archduke John: Exit table back to Villach. Rearguard overwhelmed. Will do best I can at Villach.
? [A] From Archduke John to Frimont: Retreat to Klagenfurt -- leave rearguard at Villach. 2:06 [A] From Frimont to Archduke John: Have passed Villach on way to Klagenfurt, as ordered. Prince Eugene is at Tarvis. French light cavalry division is battered. Other two infantry divisions are intact and following me towards Villach. 2:15 [A] From Mescery to Archduke John: French cavalry brigade attacking Kranj. Should we wait for them to approach Marburg?
? [F] From Eugene to Fontanelli: You are ordered to Kranj to counter force there found by Sahuc. If Austrians retreat, on to Klagenfurt.
? [F] From Fontanelli to Eugene: Sir, will do ASAP -- moving as swiftly as possible to accomplish task.
? [F] From Eugene to Fontanelli: Leave conscripts to garrison Kranj. Bring all else to Klagenfurt. 2:15 [A] From Mescery to A. Gyulai: A French column is approaching Kranj from Tarvis. Local landwehr will delay as long as possible. 2:40 [A] From Colleredo to Archduke John: I have arrived in Judenburg with two 6lber artillery, one veteran infantry regt, two Landwehr regts, one veteran cavalry regt, two Landwehr cavalry regts, and one militia cavalry regt. One landwehr infantry regt is already in garrison. 2:40 [A] From Archduke John to Colleredo: If command has been rallied, maneuver to Klagenfurt and then Marburg to form a reserve. 2:40 [A] From Jellacic to Mescery: At Klagenfurt. Remnants of Frimont's command arriving from Villach, with many French said to be in close pursuit, but none here yet. 2:40 [A] From Jellacic to Mescery. At Klagenfurt. Remnants of Frimont arrived at Klagenfurt with French in hot pursuit. Colleredo arriving from Judenburg. 2:40 [A] From Frimont to Archduke John: They mass against Villach -- not that I'll have much to do about it. Cavalry streaming around and heading towards turnpike to Klagenfurt.
? 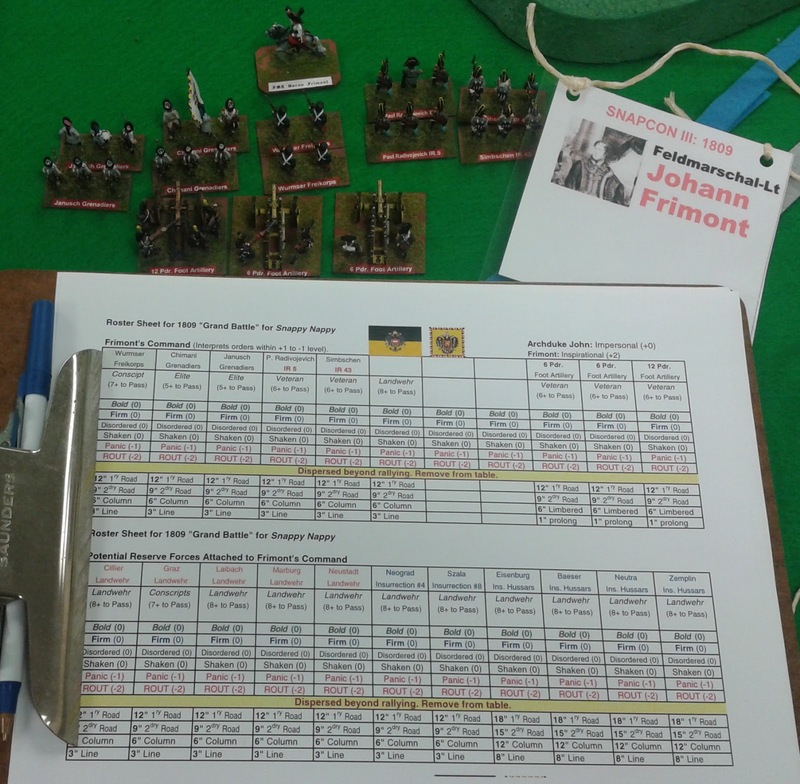 [A] From Archduke John to Frimont: The army is ready at Klagenfurt. Join them, but may delay at Villach without getting engaged. 2:45 [F] from MacDonald to Eugene: My Prince! Salzburg has fallen. I move immediately to Villach and on to Klagenfurt to join you in victory. Vive l'Empereur! 3:07 [A] From Frimont to Archduke John: Request permission to head to Graz as final reserve to prevent any French outflanking. 3:09 [A] From Colleredo to Archduke John: I am at Klagenfurt. The French are (undecipherable). I propose to fall in with the Austrian line unless you order otherwise. 3:10 [F] From MacDonald to Eugene: I have found the route Villach - Salzburg - to Linz - to Judenburg - to Graz - to Klagenfurt. Weak Austrian garrison at Judenburg. I am attacking Salzburg to Linz to Judenburg to Graz to Klagenfurt.
? [F] From Eugene to MacDonald: Great. See you at Klagenfurt. 3:13 [A] From Archduke John to Colleredo: You may start to defend with Jellacic and Gyulai, but keep a rearguard facing Judenberg. 3:13 [F] From Grenier to Eugene: At Klagenfurt. More Austrians arrived -- two infantry divisions totalling 20 infantry, eight artillery, and three cavalry. 3:15 [A] From Mescery to Archduke John: French have seized Kranj. I lost two Landwehr cavalry and one Landwehr due to lucky rolls. French advancing with cavalry division and infantry brigade with artillery. We destroyed one artillery battery and one Chasseur regiment. 3:15 [A] From Mescery to A. Gyulai: French have seized Kranj. Advancing with cavalry division, infantry brigade, with artillery. My units are returning to Marburg.
? [F] From MacDonald to Eugene: Graz is fortified with garrison of two infantry and one artillery. Am proceeding Judenburg to Klagenfurt.
? [F] From Eugene to Grenier: I come from the South. MacDonald found a route Salzburg - Linz - Judenburg - Graz - Klagenfurt and will join me. No word from Fontanelli. Continue to demonstrate only. 3:40 [A] From Colleredo to Archduke John: Survivors report that Judenburg has fallen. The French can attack Klagenfurt from the North or can move to Bruck or Graz. 3:40 [A] From A. Gyulai to Archduke John: Where are you? Three French divisions came, two in front and one behind. 3:45 [A] From Archduke John to Mescery: Retreat back to Marburg and rally when you reach Marburg.
? [F] From Sahuc to Eugene: Shot hit the fan. Marburg is blocked by entire division.
? [F] From Eugene to Pully: Change of orders. At Laibach, turn north to Kranj, then on to Marburg on secondary roads. FYI: Sahuc moves Kranj to Trzic and Klagenfurt.